Once in a while I get this question: Do you think we’re in the end times, and that Jesus will return soon? It’s something like the question that the disciples ask of Jesus. They believed Jesus was the Messiah who had come to usher in God’s reign, and God’s rule over all the earth. They believed that the Messiah had come to defeat all evil, and to set things right in the world. Their expectations were at an all-time high. The disciples were sure that the day of the Lord was at hand. They are in Jerusalem. And the disciples immediately begin to remark on impressive size and beauty of the Temple. They are simply in awe of the building. 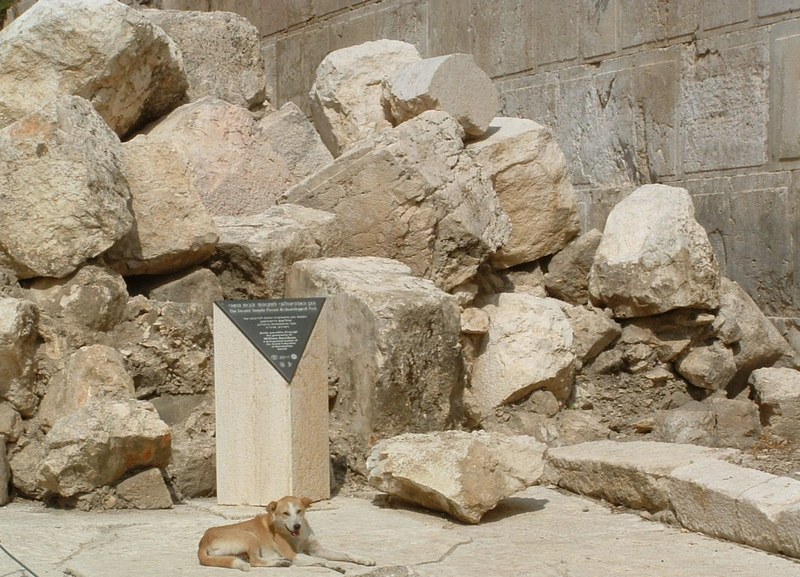 During Jesus’ lifetime, Herod built huge walls enclosing the temple area. The walls enclosed an area of 36 acres, which is the size of seven football fields – bigger than the new Vikings stadium. These walls were the height of a 12-story building, painted with gold and its courts were paved with white marble. Visitors said that when the sun shone on it in the morning you had to turn your head away because of the brightness of its radiance. It was regarded as one of the wonders of the ancient world. And you need to know that he’s not talking about the end of the world here: he’s talking about the destruction of the Temple and Jerusalem being laid waste. He knew the desire of many Jews to rise up in violent revolt against the occupying Romans. And 40 years after Jesus died and rose, they did. And, in reprisal, in the year 70, the Romans attacked the city and utterly destroyed the Temple. Not one stone was left upon another, and the temple has never been rebuilt. And although it may not have been the end of the world, I’m sure that’s exactly what it seemed like to many. One reason Jesus predicts the demise of the Temple is that it just wasn’t good stewardship. It wasn’t good stewardship because it didn’t help people draw closer to God. Remember, a few Sundays ago, we read that when Jesus made his entry into Jerusalem, he cleansed the temple, and he criticized its leaders for having only their own interests at heart, and how the noise and clamor of the money changing tables and tables selling animals for sacrifices were making it almost impossible for people to worship. The Temple was supposed to be a place where people can draw closer to God. That’s still true of any church today. Its purpose is to be a place where people can deepen their walk with God. But Jesus has been saying all along that the religious leadership had failed to do the work that God had given them to do. They just don’t get it. For Jesus, this is not about the end, but about a new beginning. Jesus says that there will also be a birth of something new that will be in line with the gifts and the calling of God. Could Jesus be talking about his community of followers, his church? When I was a boy, my Uncle Emory had a farm in Michigan. We would visit on vacation in the summers. My Dad would help Emory with the farming chores. And one thing we got to do was to pick rocks. Every year, the rocks would rise to surface and would have to be picked up; those stones had to be removed. I complained about having to do this. I worked up more sweat complaining than I did picking rocks. But, there were others who worked harder than I. And with a lot of sweat and strain, they eventually got them all picked and made that rock pile even larger. But, of course, the point of all the effort and all the sweat was not the pile of stones that it created. The point was the seed that would be planted into that soil and the crop that would result. Removing the stones and creating the right conditions for growth and a good harvest – that’s what God intends to do. The temple wasn’t producing a harvest of faith; it wasn’t drawing people into a deeper walk with God. Something new was being born. A new community based on Jesus’ teachings – a church, although Jesus didn’t have in mind another building, but rather a community of followers through whom people would be drawn closer to God. It’s faithfulness that Jesus is after. Jesus says, “Beware that no one leads you astray.” (13:5) When we pray “thy kingdom come, thy will be done” we need to be reminded that God’s kingdom, God’s will being done on this earth will not be ushered in by congress. And more wars won’t do it, either. None of these things can usher it in because the kingdom of God is a kingdom of love, the will of God is love. And love cannot be ushered in either by more laws or more wars. But it can be ushered in when God’s generosity and faithfulness, steadfastness, and grace that we know in Jesus is reflected in the lives of his followers who are generous, faithful, steadfast, and gracious. Don’t be led astray. Stay focused on God’s gifts and God’s calling in your life. Be good stewards of the many gifts God has graciously given you. When we are planting seeds, when we are tending the conditions for growth, a good harvest will result. The disciples would face hardships and persecution. It would look, sometimes, like the early church would be extinguished. There would be a temptation to give up on that which Jesus had called them to do. Jesus likened it to birth pangs. But from that labor and pain, new life will result. Jesus is calling us to work together, to be his community that the temple in his time was not, a community through whom others can find a deeper walk with God, and to be good stewards of God’s gifts and God’s calling. And so we patiently move stones – perhaps stones of apathy, or stones of indifference or neglect, or other stones that need to be removed – and we work and labor as his church. We tend this faith community, we plants seeds, and a crop begins to grow, perhaps small little seedlings at first, but if we look carefully, we can see it. In the kindnesses we extend one another; in the ministry with our children and youth; in the hungry that are fed; in the people that are cared for and visited; in the Word that is preached and taught, read and studied; in the service projects of making things and doing things for those in need; in our generosity and giving. We are a community of disciples, the body of Christ, where God can become known, and faith can be born and grow.